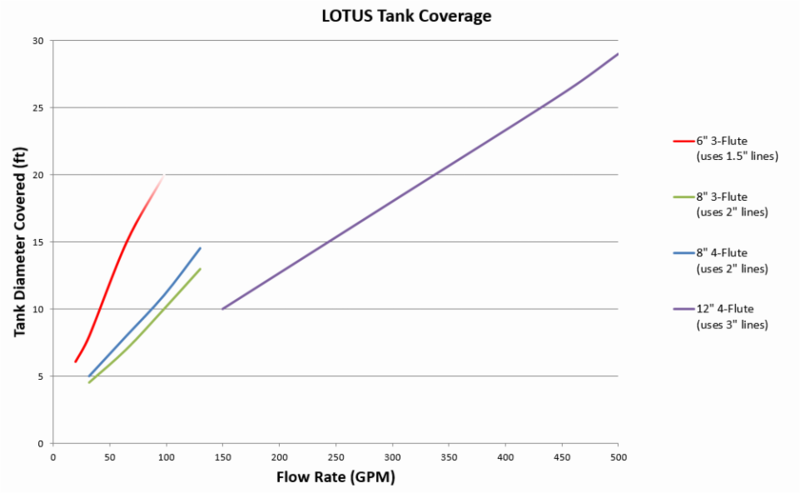 Use the graph below to help choose the LOTUS model that's right for your tank and pump. Due to the large exit velocities produced by the 1.5" lines (used in the 6" model) at higher flow rates, we recommend against using that model if you intend to pump at 75+ gallons per minute. Please note that the coverage plots shown below were tested with ~2' air gap between the LOTUS flower and the cap. This distance can be increased or decreased as needed, however doing so may affect throw radii and coverage uniformity slightly.